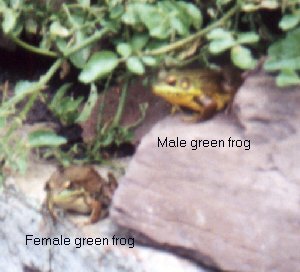 The first two frogs are for aquariums and the rest are those native to the Mid-Atlantic USA region (may exist in others areas of the USA too) that are of interest to ponders except for the common frogs which are in the UK. For a summary of the size of some of these frogs, color, egg description, time of breeding, and more, see the frog and toad table. For a complete list of all my pond frog and toad photos in one location, see my pond amphibian pictures page. A tropical frog at the National Aquarium on 8/1/14. I did not write down the species but thought this frog was really pretty! Common frogs are the most common frog in the United Kingdom. While my site and this page focuses on the species native to the United States, I get e-mails from all over the world. As such, I have gotten some photos of common frogs and will start to add them here. 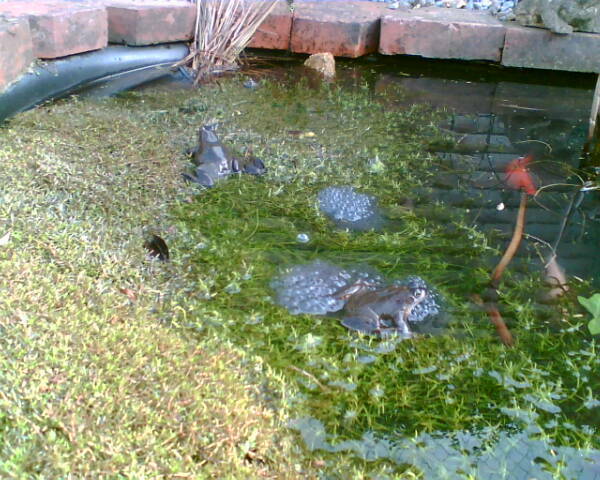 On 2/29/08, Bob in the UK sent me this photo of his pond with spawning frogs on it. You can see two large frogs, two large egg masses, and lots of submerged plants. I think they may be common frogs. If you think I am wrong, let me know. 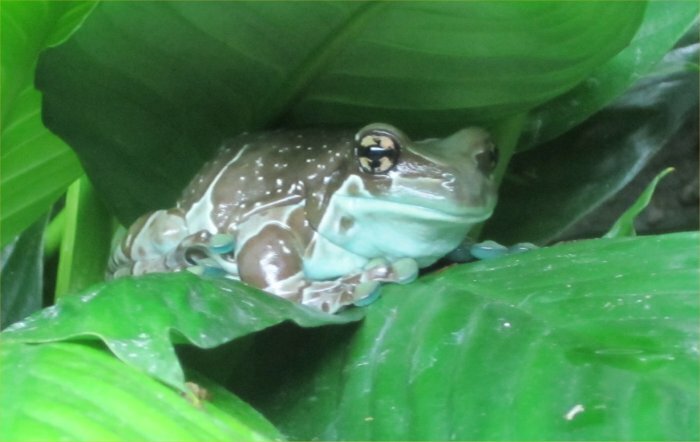 I did not previously have anything on my site about green treefrogs or other tree frogs aside from gray tree frogs and quick mentions of cricket frogs, chorus frogs, and spring peepers. I added this section to show off some photos that Daniel sent me. I may add some textual information here later. 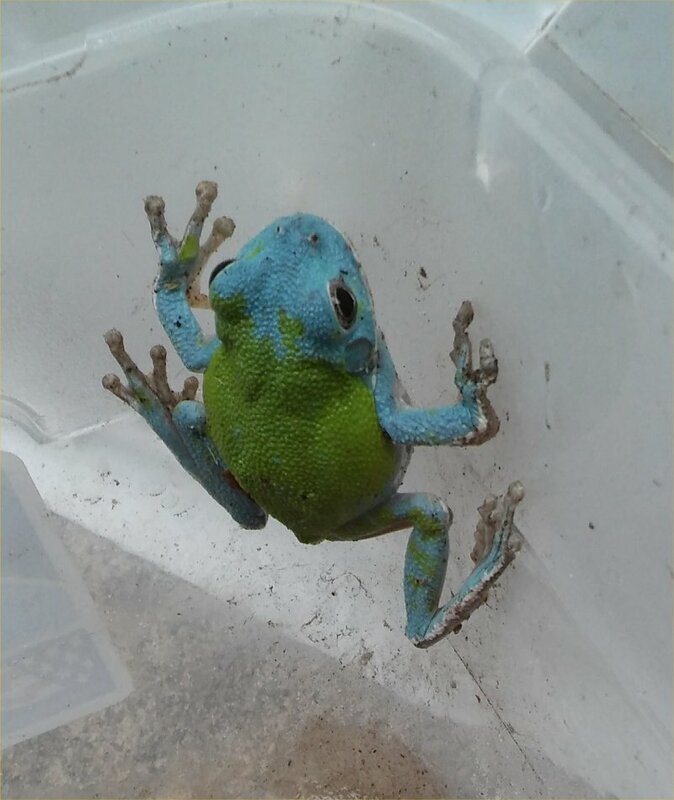 Ronda sent this photo of a tree frog on 5/18/16, perhaps a green tree frog in Georgia. What is so unique about it is that it is half blue! 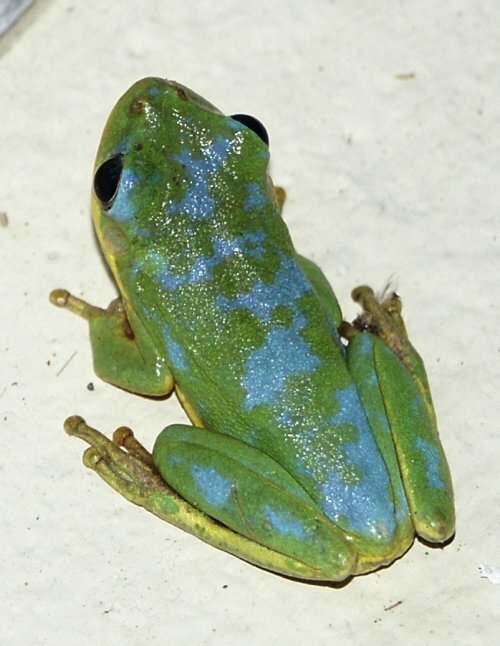 I have seen similar colors on green frogs and green treefrogs that people have sent me. 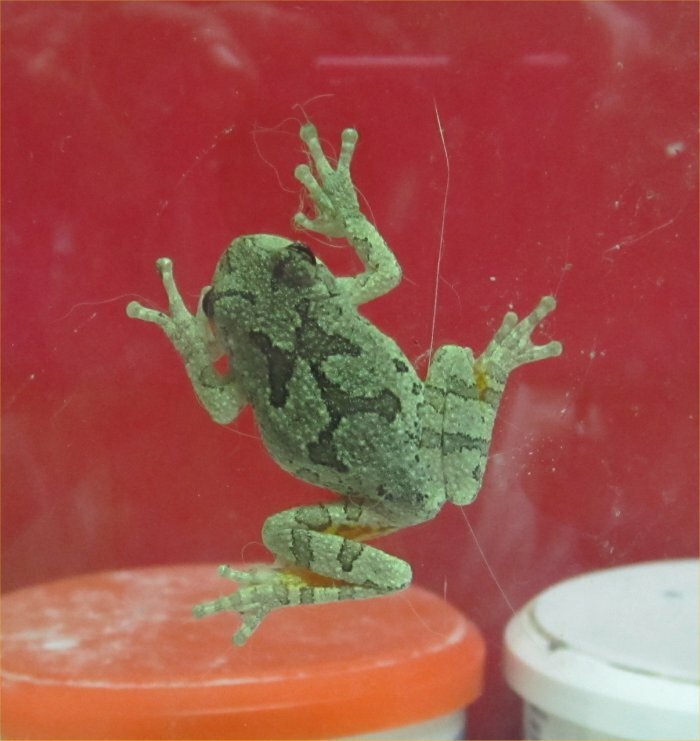 On 1/23/08, Kurt Snyder sent these photos of a tree frog in Florida. 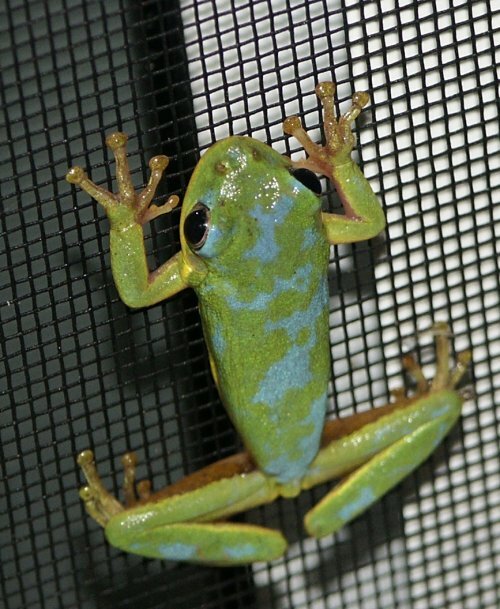 I am not positive of the identification but I think it is a green treefrog. What is unique about it is that it has splotches of blue on it. 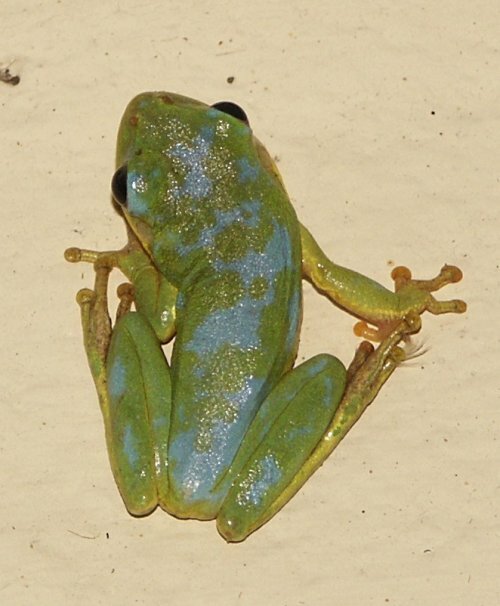 I have green frog photos sent to me too of a green frog with similar blue splotches. If you think it is some other species, please let me know. Pseudacris triseriata is the Northern chorus frog. They are also called the striped chorus frog. There are also ornate ( Pseudacris ornata ), Strecker's ( Pseudacris streckeri ), and swamp ( Pseudacris nigrita ) chorus frogs. These one inch long frogs breed in late winter or early spring. The upland chorus frog breeds early, when ice is still on the pond. Its nocturnal call sounds like dragging a finger over the teeth of a comb. 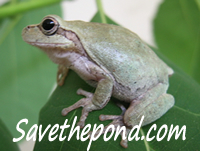 To see a photo of a Northern chorus frog and hear a call, go to this frog site . Acris crepitans is the Northern cricket frog. Acris gryllus is another species of cricket frog. They grow to about an inch long. Males make rasping calls while breeding from February to October. Their skin is rough and warty. They have a dark triangle between their eyes. The back feet of the cricket frog are webbed. Cricket frogs are diurnal. 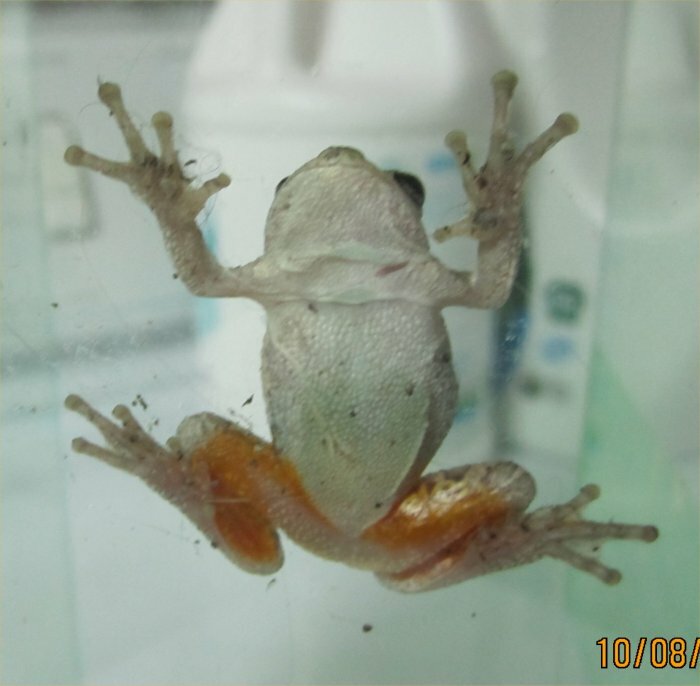 The Herps of Texas web site has a photo and information on the Northern cricket frog. You can hear and see a Northern cricket frog at Frogs & Toad of Virginia & Maryland - this is an archived version as the site is gone now. 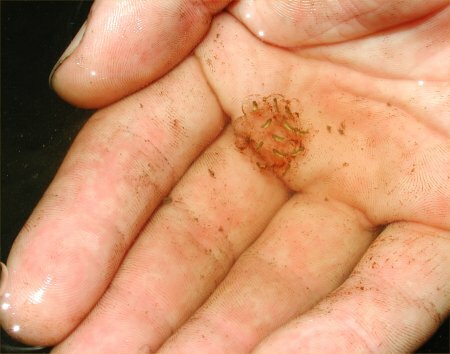 Here is a photo that the expert sent of one batch of Hylid eggs: tree frog eggs. She says they were from the Patuxent Wildlife Research Center on 6/19/01 and probably cricket frog eggs. She says the yellow-brown color of the embryos is characteristic of Hylid species. A spring peeper that I found in the basement on 10/8/13. Hyla crucifer , signals spring is near and so is called the spring peeper. They start cheeping at night during February or March and continue for a few months. The 850 some eggs laid during mating hatch in about a week and change to adults during the middle of the summer. These small tree frogs (1.5 inches) are rarely seen but you can sure hear them! They are only the size of your thumb nail but louder than any other wildlife! Their call is like a high whistle during the evening or on overcast days. The males like to sing in trios. They have a dark cross on their backs and bands on their legs. 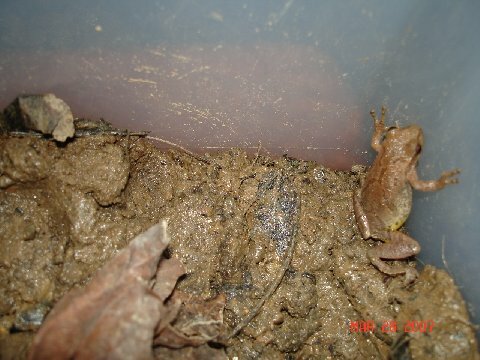 Spring peepers eat insects and other tiny creatures. As adults, they can climb trees but also spend a lot of time on the ground or in the dirt. They hibernate under tree bark and logs. 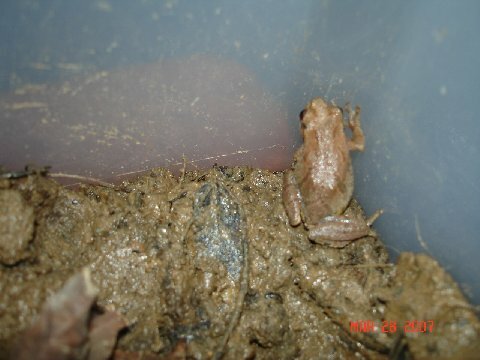 On 3/28/07, Jon sent me these three photos of a frog that he had caught. I think it might be a spring peeper, maybe female. If you think otherwise, please contact me. 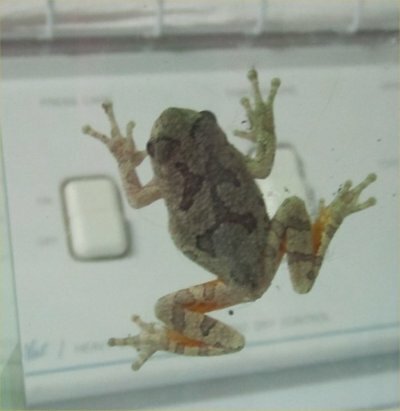 He did release the frog back to the wild. On 10/8/13, my cat was looking at something in a funny manner in the basement. I figured a cricket but it turned out to be a spring peeper! He must have come in with one of the house plants that I brought in for the winter. I put the little guy in an empty syringe filter box (green plastic container) to take these photos. 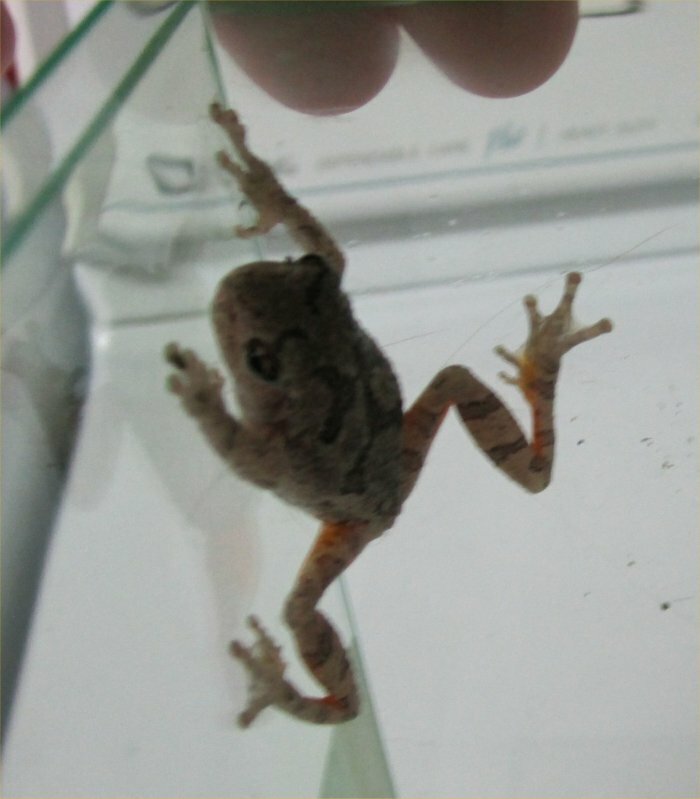 Spring Peeper - tummy view; look at those suction cups! Spring Peepers Calling Video from sometime in late April 2017 in my back yard. 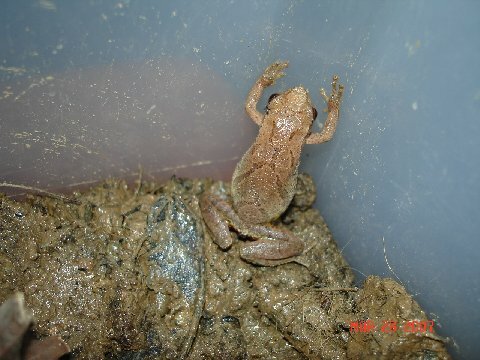 To see a photo of a spring peeper, hear a call, and get some info, go to this frog site . Replay the sound over and over to get the effect of how they really sound. 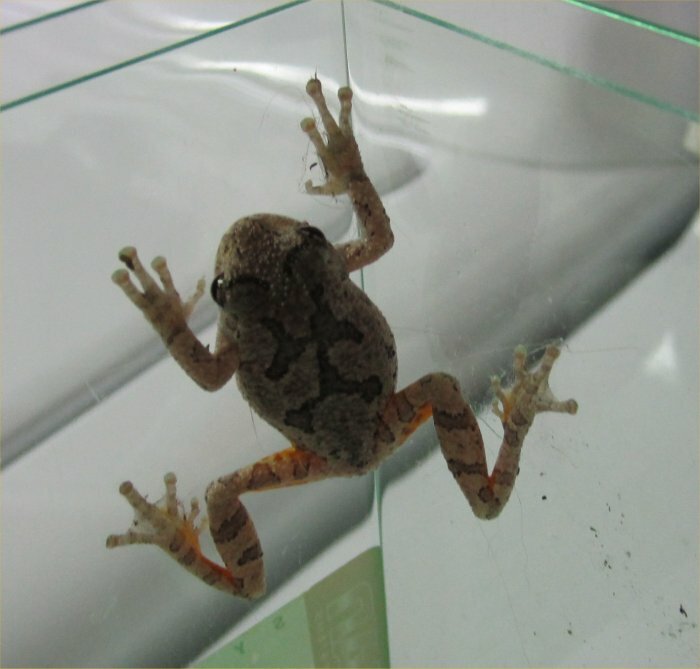 The Herps of Texas web site has a photo, call, and information on the spring peeper as well. You can hear and see a Northern spring peeper and its tadpoles at Frogs & Toad of Virginia & Maryland - this is an archived version as the site is gone now.